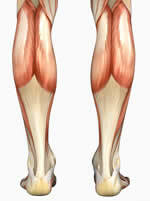 The gastrocnemius (calf) has two heads. The medial head and lateral head. The function of the gastrocnemius is ankle plantar flexion and knee flexion. The origin of the gastrocnemius attaches to the posterior medial condyle on the femur. The calf inserts onto the achilles tendon on the calcaneous. 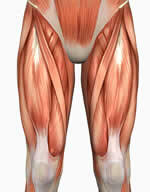 The calf can be trained more often than other muscles but keep at least 24-48 hours of rest between heavy training. Leg Curl or Hamstring Curl 1. Lie on the machine comfortably while hooking your legs underneath the pad. If you are on the seated chair leg curl then sit comfortably with your legs between the pads.